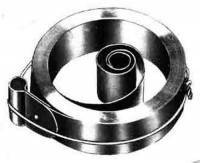 Description: 3/4" x .05" x 170" long loop end 31-day mainspring for Japanese and Korean clocks. Made of high grade Japanese steel. Metric equivalent is 19.0mm x 0.38mm x 4318mm.